My daughter and son-in-law traveled to Idaho recently to visit his family, and while they were there they celebrated his mom's 60th birthday. I heard that she liked tulips, so sent along these cookies for her. Recently, my sweet friend Heather of SprinkleBakes, sent me a surprise package with some sweet baking supplies: cupcake cookie cutter, a cupcake kitchen towel, and some cupcake icing decorations; it made my day! Last Tuesday, my friend (since 2nd grade) came for a couple of days to visit. She asked beforehand if we could decorate cookies when she came, so I thought it would be the perfect time to put all the cute cupcake supplies to good use. These cupcake cookies were made using the sugar cookie recipe from Heather's fabulous book, They turned out perfectly shaped and delicious! Thanks Heather for the fun goodies! 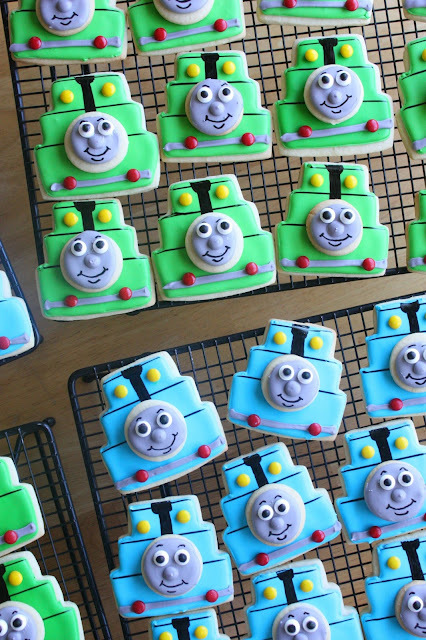 Lastly, I made about 50 (plus some for my grandsons) Thomas the Train (and Percy) cookies for a friend's twin nephews celebrating their third birthday. I was very busy last week, so started these a little later than I had planned to. I stayed up till 3:45 a.m. finishing them and then had to be up at 6:30 a.m (on the day they were due). 2.5 hours of sleep is not enough, and I vow never to do that again. At least everyone loved the cookies. A special Thanks to Elizabeth of SweetArt Sweets for the Thomas cookie design inspiration! Love all the cookies...my 2 year old would freak over the Thomas cookies! Love how you made them! these are all great! i love the thomas ones, and it looks like a cake cookie cutter for the base? awesome. My little one LOVED thomas for a long time, but he seems to have grown out of it (sigh) so thomas always reminds me of his toddler years, so thank you for sharing these!! I can't imagine pulling an all-nighter cookie decorating but the young birthday boy and your grandson must have loved their Thomas the Train and Percy cookies. They are adorable. 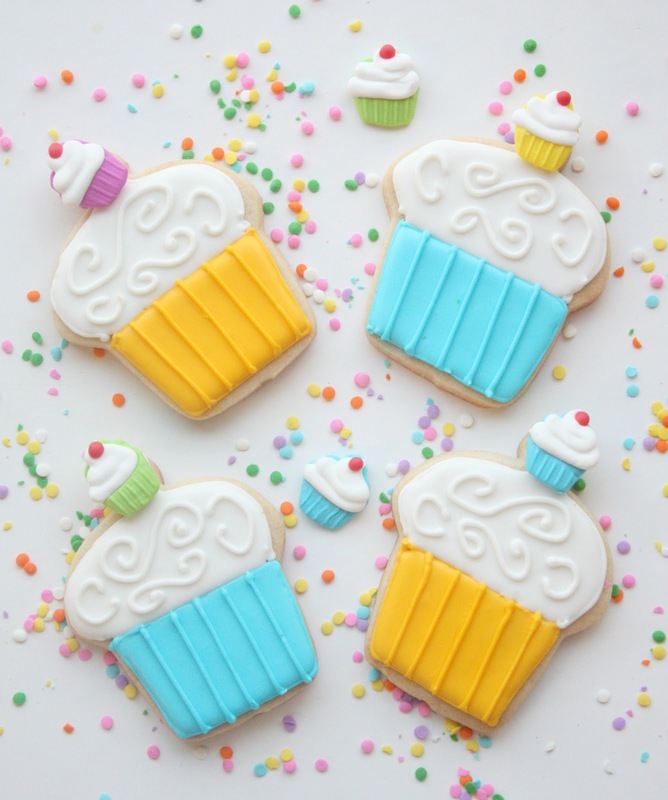 Putting teeny decorated cupcake cookies on the top of the cupcake cookies was such a cute idea and tulip cookies on blue gingham backgrounds are the perfect 60th birthday gift. I bet your son-in-law's Mom thought that your cookies was her favourite present. These are so pretty Sue. I adore the top one with the tulip, and the cuteness of the little mini cupcake at the top of the cookies is probably the cutest thing I've seen all week, Thomas steals the show,I have yet to make Thomas. Hope you get to rest in a few, sounds like you've been really busy! You have been busy Sue! They are all darling, but I'm dying over Thomas! Dare I say they were worth the loss of sleep!? (Although I've been there and know how horrible it feels not to sleep). Sue, you are amazing! My son went through the whole Thomas phase (for years) and he would have freaked if he had these cookies! They are amazing. And the cupcakes are so darn cute. I love the double decker tulip. You are so incredibly talented! Wow, what fun cookies--I am always amazed by your talent. You inspire me!! Sue, you life sounds crazy like mine! Such cute cookies. I love all three of them. Wow, 2.5 hours of sleep and I would have gotten a cold for sure. I don't need a lot of sleep but I do need some. You are too nice! Your cookies are (always) amazing, Sue!! 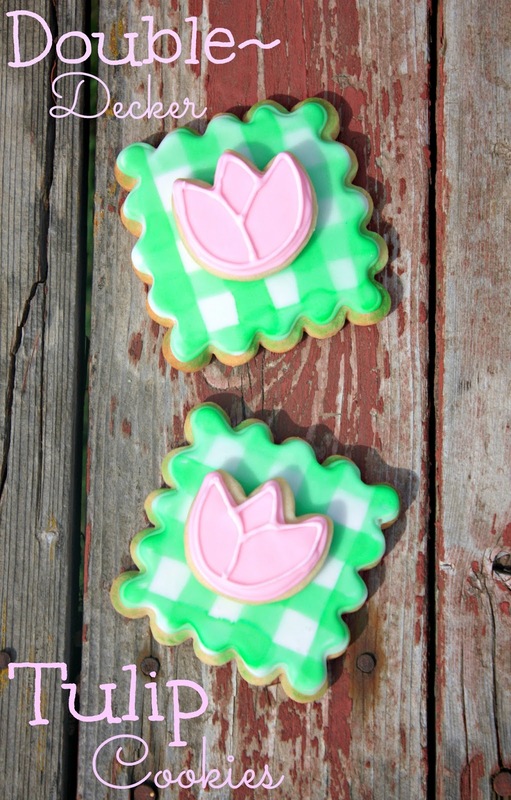 I'd love to know how you achieved the gingham design on your tulip cookies. They are fantastic!! Hi Janet, I sent you a long-winded email:) Sorry it's so late!